Tom Sutcliffe is joined by novelist Deborah Moggach, historian Dominic Sandbrook, and musician Pat Kane to review the cultural highlights of the week. Tom Sutcliffe is joined by novelist Deborah Moggach, historian Dominic Sandbrook and musician Pat Kane to review the cultural highlights of the week. Film director Tim Burton's reworking of Lewis Carroll's classic tale Alice in Wonderland has a 19-year-old Alice returning to the magical world of her childhood adventures. 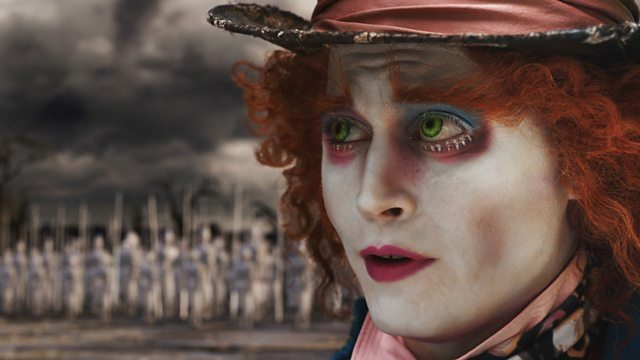 She reunites with her old friends and learns of her true destiny: to end the Red Queen's (Helena Bonham Carter) reign of terror with the help of the Mad Hatter (Johnny Depp). It also features the voices of Stephen Fry, Alan Rickman, Barbara Windsor and Matt Lucas. At the theatre we are promised a 'truly terrifying experience' in Ghost Stories, from Andy Nyman and one of The League of Gentlemen's masters of the macabre Jeremy Dyson. It takes the form of a lecture by an academic specialist in supernatural folklore; as he lectures on the human fascination with the uncanny, three of his case histories play out on the stage behind. Tim Pears's latest novel, Landed, tells the tragic story of Owen, brought up in the Anglo-Welsh borders by an affectionate but alcoholic and feckless mother. His sense of self is rooted in his long, vivid visits to his grandparents' small farm in the hills. There he is deeply impressed by his grandfather's primitive, cruel relationship with his animals and the land. As an adult he moves to an English city and builds a new life, working as a gardener. He meets Mel, and they have children. But then a tragic accident devastates Owen's life and starts him on a journey of self-discovery. Artist Richard Hamilton was one of those to popularise the Pop Art movement and, from his 60s Swinging London series to Tony Blair as a cowboy, he has been ahead of the curve ever since. His latest exhibition at London's Serpentine Gallery is Modern Moral Matters, which looks at the ways in which the media represents modern society. Much of the work on show focuses on his obsession with global politics and the manipulation of the media. Themes such as riots, terrorist acts and war are all included in the artworks, with a focus on how they are fed to the masses through television, newspapers and the internet. In a three-part documentary series, Inside John Lewis, BBC2 looks at the department store's 150-year history and how it is dealing with the current recession. The young Victorian orphan-turned-entrepreneur John Lewis began his career in 1864 when he set up a draper's shop in Oxford Street. Sixty-five years on his son, John Spedan Lewis, turned it into the huge co-operative it is today: the John Lewis Partnership. The series explores whether a business model developed in the 1920s can really survive the commercial turmoil of the 21st century.